To create a bookmark, right-click on a web page and choose Bookmark This Page (or click Bookmarks > Bookmark This Page) If you accept the default folder location, the page will be listed at the bottom of Bookmarks in the File Menu. You can also file bookmarks in the Bookmarks Toolbar by dragging a web site's icon into the toolbar, creating a single-click button for quicker access. The button takes the name of the web site, which sometimes is too long to be helpful. You can rename toolbar bookmarks by right-clicking the button and left-clicking Properties. Enter something brief in the Name field, or consider removing the entire name and leaving just the icon in your Toolbar. 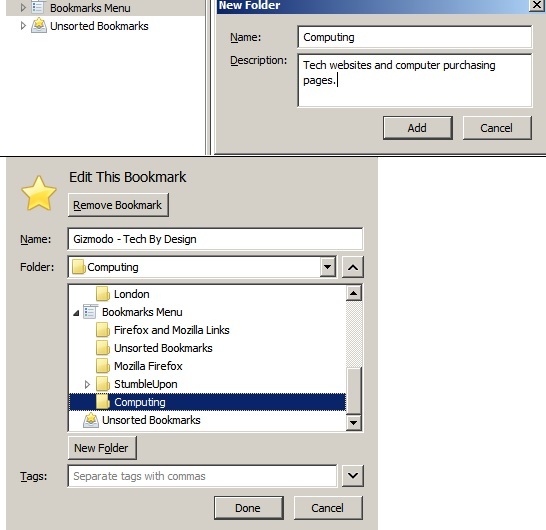 You can create folders of bookmarks either in the Bookmarks Menu or in the Bookmarks Toolbar. Click Bookmarks > Show All Bookmarks. Select either the Menu or the Toolbar and then click Organize > New Folder. Type a folder name to represent a category of bookmarks. When you create new bookmarks, you can choose this folder to file it in. Note: The bookmark star located on the far right of the URL field takes you to the same screen as the above, where you can create and choose folders in which to file bookmarks.